Welcome 2016! If you are a new or expectant parent of twins, trips, or more come and ask all those questions that singleton parents have no idea what you are talking about! How do you nurse two at a time? What do you do when you are shopping with two infants? What’s the best kind of stroller to use at each age? Come on over because we’ve “been there, done that!” If you have older multiples, please come join us to share the tips and tricks that have helped you survive and thrive over the years. Also, we all like to have some fun so bring your favorite board or group game and we’ll play the night away (or at least until the babysitter has to leave and you have to go home 😆)! Our July meeting will be a couples ice cream social for everyone to chat and mingle, fill out sign up forms and pay dues for the new club year, find out about the super awesome events we are planning, and let us know how you’d like to be involved! 😃 Moms and dads are both welcome, as well as in-arms infants. Please bring an ice cream topping and an individual drink. Our usual room in the church is being renovated, so check the side entrance doors for directions where we will be at meeting time. Please RSVP to the event in the members only Facebook page (https://www.facebook.com/events/895750603840706/) or by emailing us at knoxmultiplesclub@gmail.com. Posted in Monthly Meeting. Bookmark the permalink. Are you a new or expecting parent of multiples? Are there questions about parenting multiples that you would like to have answered by someone who’s been “in the trenches” for a while? If so, please join us for a new/expecting parent Q&A session. In-arms infants are welcome. Please join us and help support our new and expecting parents. I know that first year is a blur, so let’s join together and piece together our experiences to share with these parents. Bring a snack to share and an individual drink. Please enter through the side entrance of the church next to the covered driveway. The gym will be in use by another group. Please rsvp to the event on our Facebook page so we will have an accurate count. If you don’t have a Facebook account, you can email knoxmultiplesclub@gmail.com. What: Meal planning and preparation can be overwhelming, especially when you have little ones under your feet or are rushed to fit in activities and homework for your older children. Are you looking for some new recipes for quick weeknight meals? Would you like some tips on meal planning and pantry organization? Please bring copies of your favorite quick, weeknight meal recipe and join us for some great tips on meal planning and pantry organization. You’ll leave with some great new recipes, affordable pantry organization ideas, and confidence to tackle meal planning. Please join me for a planning meeting to brainstorm ideas for the upcoming year. Please bring your ideas and be ready to volunteer to help where needed. I have some great ideas for meetings and events, but I need your help to execute them. Space is limited, so be sure to sign up early! Chick-fil-a nuggets, tea and a dessert will be provided. What: Join us for a game night and chocolate fondue. We will play some fun group games that will allow us all to get to know each other better and indulge in chocolate fondue. We’ll provide the chocolate and ask you to bring the items to dip (i.e., marshmallows, strawberries, bananas, pound cake, cheesecake, pretzels, or anything else you think would be delicious coated in chocolate). Please bring enough to share and also bring an individual drink. Also, if you have a fondue pot or small crock pot we could borrow for the chocolate, please message me and let me know. 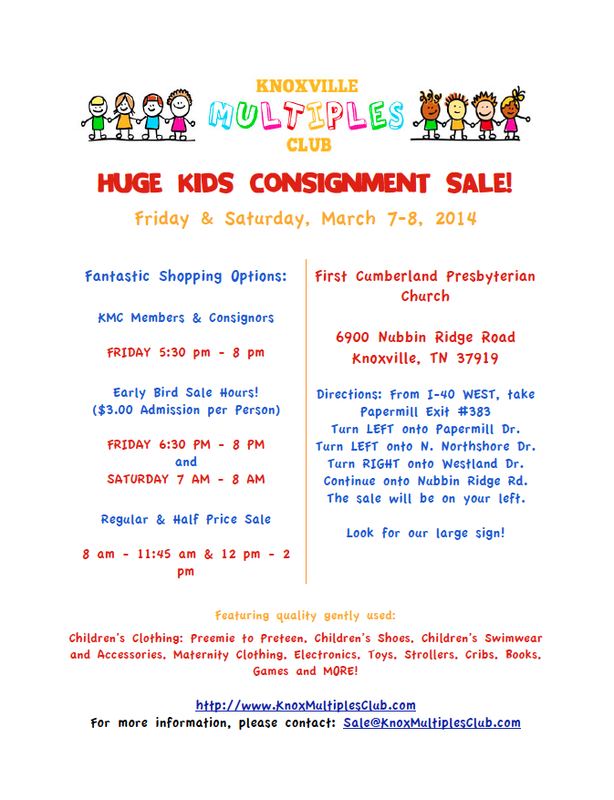 Spring / Summer 2014 Consignment Sale! Comments Off on Spring / Summer 2014 Consignment Sale! Posted in Consignment Sale and tagged consignment sale. Bookmark the permalink.